The Vinland Phenomenon project lives from Newfoundlanders sharing their stories and ideas about Vinland. 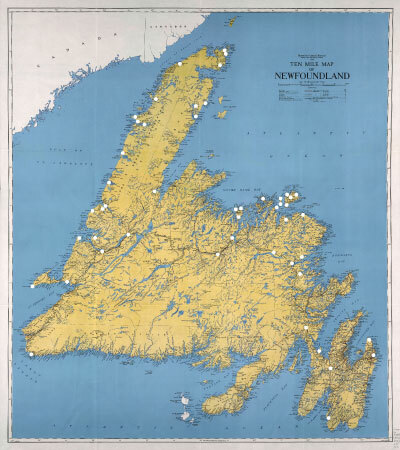 Beside giving two radio interviews on VOBB and CBC Radio I asked for contributions through the distribution of a Vinland Questionnaire all over the island. While the actual response to the questionnaire was rather modest, the act of posting it in public spaces resulted in some most project-relevant conversations and contacts. Moreover, documenting the scenes with the posted questionnaire became a project of its own. It mirrors my travel route and my quest for Vinland stories all over Newfoundland − virtually a meta-quest for the Vinland quest of others. The places where I posted my questionnaire include gas stations, convenience stores, pharmacies, libraries, museums, ferry terminals and an airport. All of these offer a bulletin board or some space where everyone can put any kind of posting, from selling a car or a property over community announcements to advertising pet grooming and the invitation to a local dance. 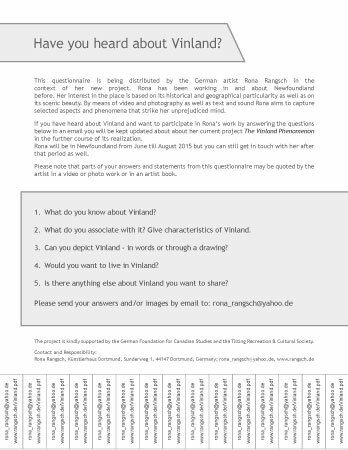 The photographs in this chapter show a selection of the total of 49 places where the Vinland Questionnaire had been posted.